ELMO Recruitment and Applicant Tracking System (ATS) is a highly configurable system that helps streamline the hiring process from job requisition approval through to offer acceptance. 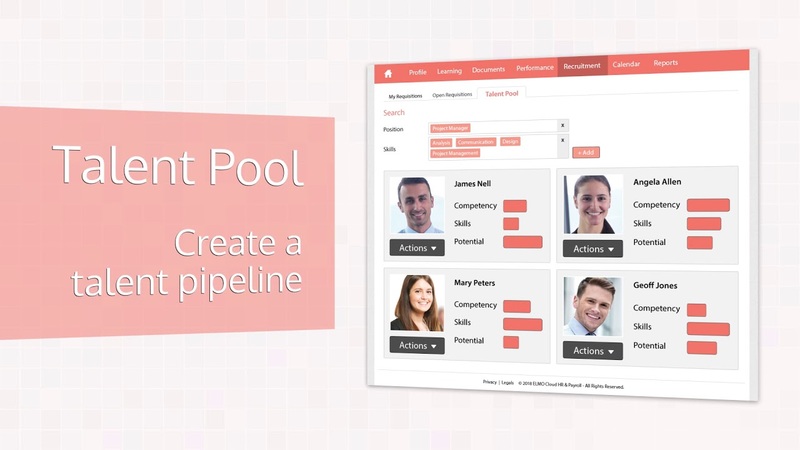 It enables organisations to build candidate sourcing capability, and also helps you refine recruitment workflows, screening questions and interview processes – all while promoting your value proposition to attract the best talent. ELMO’s recruitment software fully integrates with the entire ELMO cloud HR & payroll suite. Manage and drive your recruitment strategy from a simple-to-use, centralised system. From requisition creation to offer acceptance, our in-built tools will help reduce time-to-hire. The requisition and recruitment workflow generator means you can create requisitions for new positions in minutes and start actively recruiting instantly. Reduce your cost-to-hire, thanks to branded external and internal careers portals, integration with external job boards and the ability to create talent pools. ELMO Recruitment can be integrated with your agency to track and manage externally sourced candidates. Find out more details about ELMO Recruitment.